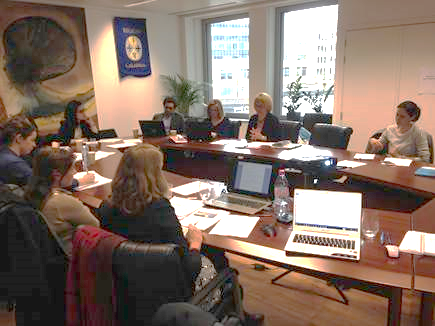 On Wednesday 6 April 2016, the “Atlantic Strategy” working group of the CPMR Atlantic Arc Commission gathered in Brussels. At the request of the five Atlantic Member States (Portugal, Spain, France, Irland and the UK) and upon a proposal earlier made by the CPMR Atlantic Arc Commission, the European Commission –DG Mare, will include a specific budget dedicated to the implementation of the Atlantic Action Plan in its next work programme for 2017-2018. Basically, this means that there will be an open call for proposals next year to support the implementation of the Atlantic Strategy. The objective of this “Atlantic Strategy” working group meeting was to react to proposals made by Member States to define the priorities to be opened to EU funding. After the meeting, this working group was able to send a four-point contribution on what the Regions would like to see included in this call. First, the AAC insisted on the necessity for the call to be broad and not too scientific as this kind of project can be financed by Horizon 2020. Secondly, the AAC members underlined their willingness to adopt a more “human centered” approach. Selected projects should put the emphasis on training, reducing unemployment, improving conditions for sea-farers, etc. Thirdly, it was decided to call for a better embedment of the priorities of the Atlantic Action plan in other EU Programmes. Considering that the EMFF budget available for this call will be quite small, the AAC members insisted on the need to better take into account the Atlantic transnational dimension in other EU calls for proposals. Finally, the AAC also undertook to prepare a study on the priorities of national and regional EMFF in the Atlantic Regions. This study will help bridge gaps between projects financed at national and regional level and try to upscale it at a sea basin dimension. During this meeting, members also agreed on the political messages to be included in the next AAC Final Declaration. This declaration will be presented during the 2016 General Assembly, taking place in Pamplona on 2 and 3 June 2016.